Description: 574 hauls WF-2 out of Waterville, bound for Farmington. 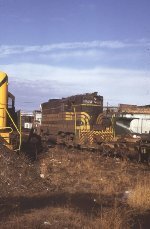 Title: Maine Central Railroad GE "Independence Class" U18B No. 402, "General John Stark"
Description: Rigby Yard - MEC GE U18B No. 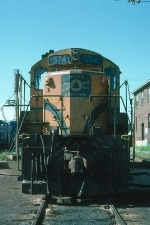 402, EMD GP7 No. 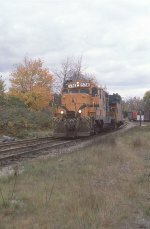 574 and GE U18B No. 400. Description: POPY's headend at East Deerfield West, the "dry bridge". 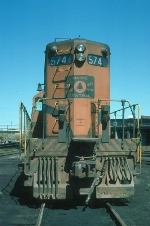 Description: Maine Central Railroad GP7 574 at South Portland, Maine on January 15, 1985, Kodachrome by Chuck Zeiler.